My cousin Mary Kay, a pediatrician in Cleveland, has a clinic partner who hails from Cairo. When Dr. Mervat came from Ohio to visit her family here in February, she invited me to dinner with them. She and her sisters all have names that begin with M (much like another family I know). At that dinner, Mervat’s sister Magda and her husband Samieh promised to take me out to see some of the oldest monasteries in the Middle East. 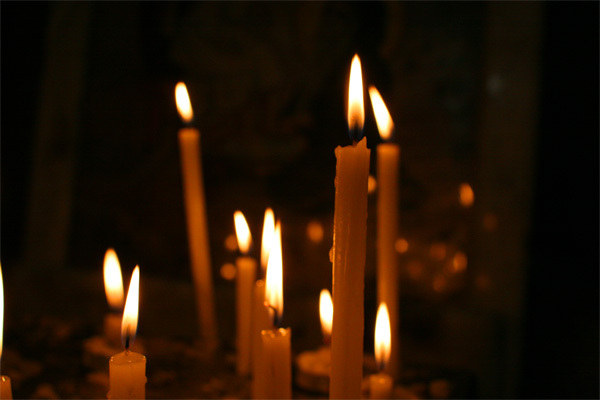 We had to wait until after Easter, when the sites once again opened their doors to non-members of the church. Last Saturday, Samieh and Magda treated me to a tour of two monasteries and a retreat center founded by a priest who does a great deal of charity work in upper Egypt. Copt is a word meaning “Egyptian,” derived from the Greek Egyptos. 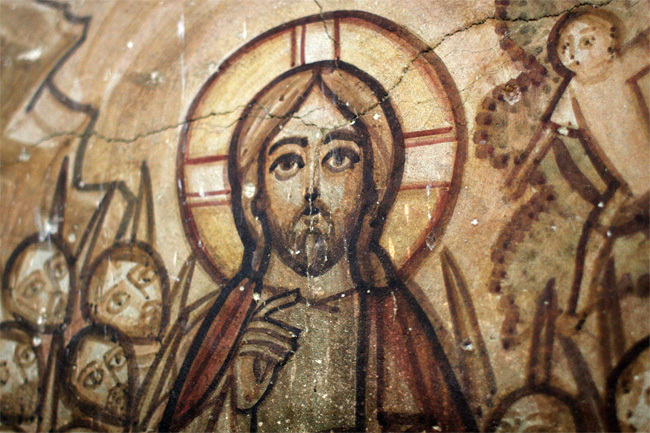 But its meaning has developed over the years so that today the word Coptic refers to Egyptian Christians. 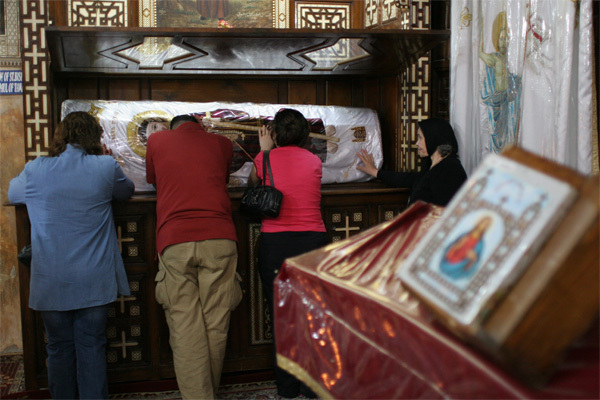 About 15% of Egyptians are Christians and some 95% of them are members of the Coptic Orthodox Church of Alexandria. The first monastery on our tour was in an area called Wadi Natrun, and has a Monastic complex dedicated to St Bishoy, a priest born in the fourth century AD. My tour guide was an English-speaking priest (a former Chemist who had spent time in Europe and has two brothers in New Jersey) who spent more than an hour taking me among the sights there and explaining details about the history of the place. 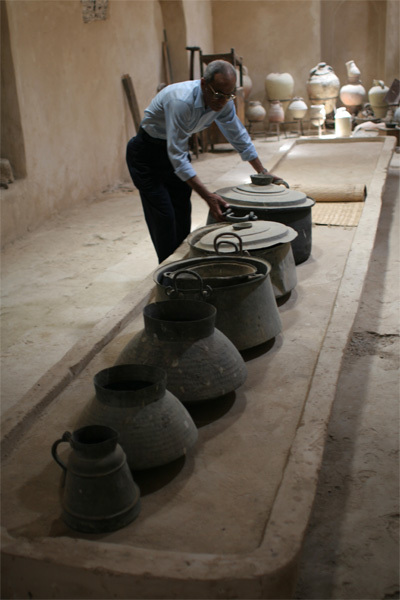 And he showed us inside some of the rooms, not on the tourist route, where monks would gather for fellowship. 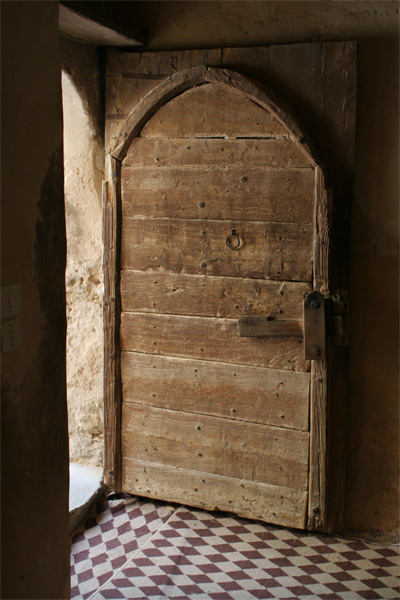 There’s an old tower where the monks would also gather, but that was for protection from invaders, be it from the Berbers — who regularly attacked over the spane of a few hundred years — or others through the ages. 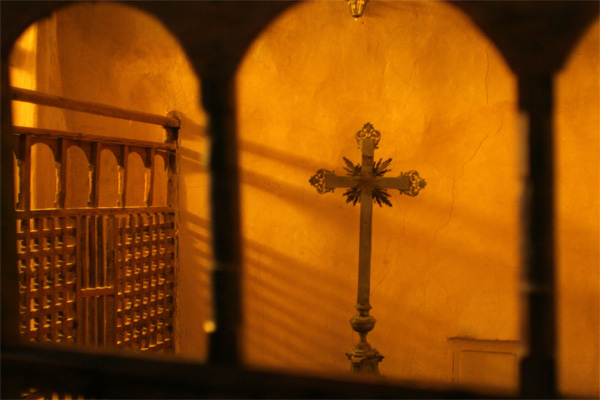 And in the sanctuaries of the churches there are altars with the relics of saints Bishoy and Paul of Tammua. The walls have frescoes, and the altars are decorated with wood carvings from centuries past. There’s also an old grain mill that was once powered by donkeys. 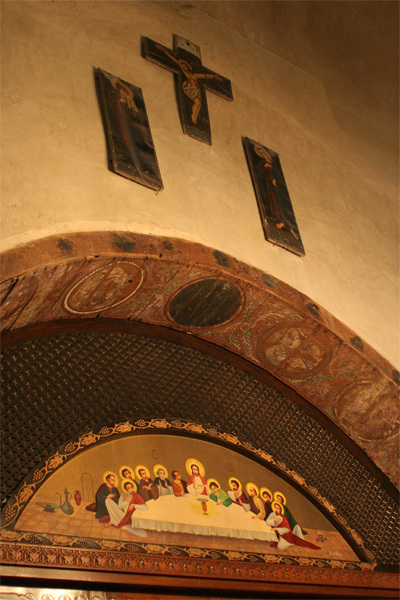 We then went to Samieh and Magda’s favorite monastery, where they come regularly, they say, to “be close to God” and find solace and a break from the hustle and bustle of Cairo. 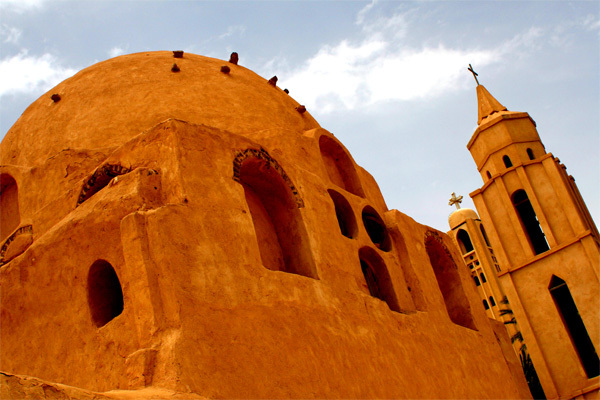 The Monastery of St. Macarius is about 90 kilometers from Cairo, off the main desert highway to Alexandria. 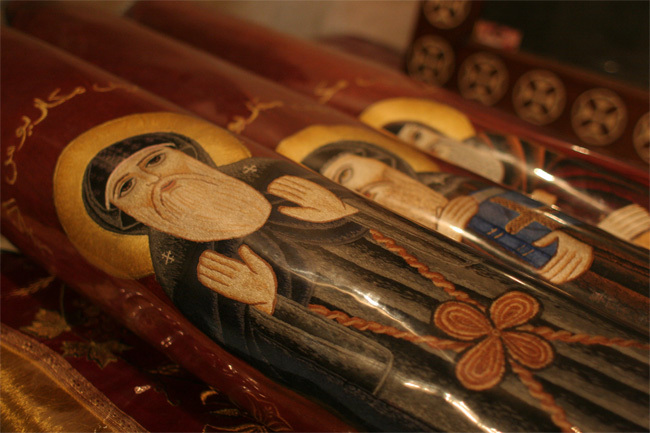 The monastery was founded by the eponymous Saint in 360 AD. And from the fourth century to the present day, it has been continuously inhabited by monks. 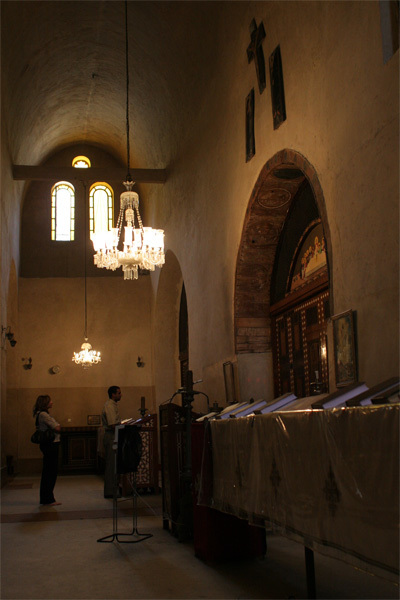 One altar is said to contain the relics of both St. John the Baptist and Elisha the Prophet. As we walked among the peaceful sanctuaries and chapels, I could see why Samieh and Magda go there so often.